Beverly is an Associate Marriage and Family Therapist. She received her Master’s degree in Clinical Psychology from Golden Gate University San Francisco, and also has a Master’s degree in Community Health Nursing from University of California San Francisco, which gives her a well-rounded perspective in mental health. She enjoys working with couples, families and individuals providing guidance and support using a holistic approach that promotes wellness, and highlights and encourage client’s strength as they transition through a crisis. Beverly has worked with high-risk youth & their families. She’s interested in addictive behavior as it relates to substance abuse, and food addiction, and has experience with 12-step programs. She enjoys working with diverse populations emphasizing the worth and value of each individual. 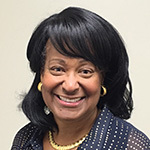 Beverly gives them tools to help them maneuver through conflicts surrounding ethnicity aiding in the multicultural journey to cultural competency. Beverly enjoys working with individuals as they relate to part of their family within a family unit, introduced by Dr. Murray Bowen as a family system theory. “Bowen believes that individuals cannot be understood in isolation from one another, but rather as a part of their family, as the family is an emotional unit.” In addition she likes to use cognitive behavioral approach with clients helping them look at their core beliefs and how they affect behaviors, feelings and thoughts. She has expertise in the areas of faith and spirituality, and is actively involved in her church as the leader of a women’s prayer group.